Arizona’s third largest city, Mesa is home to unique museums, scenic parks and activities for visitors of all ages. Stop by the Mesa Arts Center to view art and watch a theater performance, get to know Sonoran Desert plants by hiking through Usery Mountain Regional Park, and watch a baseball game at Hohokam Stadium. Best things to do in Mesa with kids include the Arizona Museum of Natural History and learn with hands-on exhibits at the i.d.e.a. Museum. 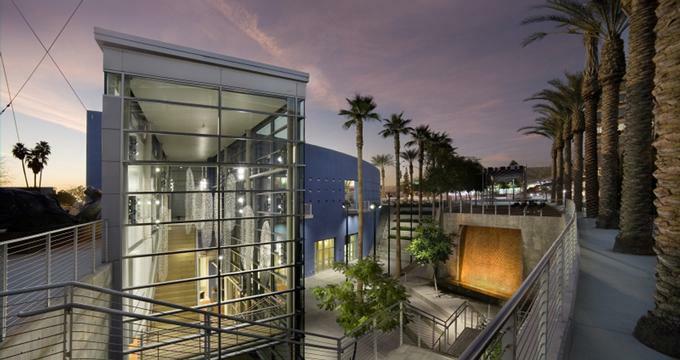 Located on East Main Street in downtown Mesa, the Mesa Arts Center is a 210,000 square foot center for performing arts as well as visual arts. Opened in 2005, it is the largest arts complex of its kind in Arizona and one of the top Mesa attractions. The center consists of four performance venues, including the 99-seat Farnsworth Studio Theater and the 1,600-seat Ikeda Theater; five art galleries comprising 5,500 square feet of exhibition space for the Mesa Contemporary Arts center; and 14 performing and visual arts classroom studios. Located on North Usery Pass Road, Usery Mountain Regional Park is a 3,648-acre park that offers camping locations, mountain biking and hiking trails, and scenic landscapes. There are 73 campsites in the park, and these include hook ups, picnic tables, barbecue grills, and more. There are more than 29 miles of trails in the park that can be used for hiking, horseback riding, and mountain biking. Trails range from short and easy to long and difficult and offer visitors stunning views of the area. The park hosts many special events such as Archery 101, Full Moon Hike, Movie Night in the Park, and many more. If you are looking for things to do in Mesa AZ with kids, this is a great place to visit. Roses do bloom in the desert. 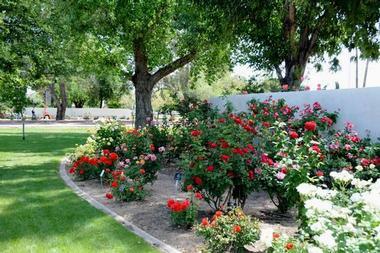 In the Mesa Community College Rose Garden, more than 9,000 roses of 300 varieties bloom and thrive to the pleasure of visitors, tourists, students, and kids who come for a visit. This is the largest rose garden in the Southwest, and it is not only a beautiful garden to enjoy but also a study area and a botanic laboratory. The garden was established in 1997 in a collaborative effort between Mesa Community College and the East Valley Mesa Rose Society. The garden depends on a large number of volunteers and donations for its maintenance and care. There are some varieties of roses blooming almost any month of the year, but the best time to enjoy this magnificent garden is spring and fall when the vast number of roses in bloom create a riot of colors and the smell of open blooms is almost intoxicating. Hohokam Stadium, located on North Center Street, is a 12,500-seat baseball park in Mesa. 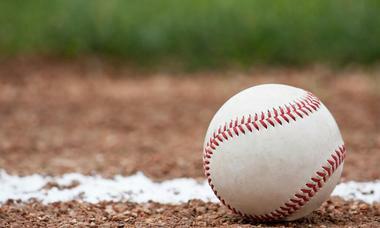 It is also known as the Dwight W. Patterson Field, and was formerly called Hohokam Park. Completed in 1997, the stadium is named after the Hohokam people, Native Americans who lived in this area of Arizona from about 1 AD to approximately 1450 AD. The original stadium was built in 1976 and was the spring training stadium for the Oakland Athletics and later for the Chicago Cubs. The 1997 stadium was renovated in 2015, and the Oakland Athletics now use it once again for their spring training. The renovations include new seats and the largest scoreboard in the Cactus League. The Mesa Historical Society established the Mesa Historical Museum in 1987, and it is located in the 1913 building that originally served as a school. Its auditorium was added in 1930 as a project of the Works Progress Administration. The museum building and the auditorium are listed on the National Register of Historic places. The museum’s permanent collection contains a large number of objects that depict the history of Mesa, including a very good replica of an early adobe school. The museum also has a comprehensive collection of early agricultural tools. Three galleries host changing exhibits such as Hidden Mesa: Rediscovering the West and Come Fly With Us! Celebrating Thirty Years of the Boeing Company in Mesa. Located on North MacDonald, the Arizona Museum of Natural History exhibits displays related to the culture, habitat, and history of the Southwestern United States. It was founded in 1977 as a small museum in the Mesa City Hall, a historic building dating from 1937. Over the years as the museum’s collection grew, the building was expanded and now contains 74,000 square feet. About 46,000 square feet are used for exhibitions that display the collection of 60,000 objects relating to the anthropology, art, cultural history, and natural history of the area. The museum also holds 10,000 historic photographs. In addition to its permanent collection, the museum mounts several temporary exhibits. Mesa Arizona Temple is a LDS Church temple famous for its unique architecture, beautiful gardens, a stunning holiday light display and a nativity scene. Mormon missionaries at the visitors' center are available to answer questions about the temple grounds and the gardens. The annual Mesa Easter Pageant is held in March, letting visitors experience the story of Jesus Christ through music and dance. More places to visit: Best Things to Do in Sedona. The Rockin’ R Ranch is a real historical working horse and cattle pioneer ranch that has a special place in the history of Arizona. Charles Innes Robson I, a great-great grandfather of the current ranch owner, was one of the four original pioneer families who founded Mesa. Today, the ranch offers visitors the opportunity to experience the thrill and excitement of the Wild West through staged gunfights, wagon rides, gold panning, fabulous cowboy barbecues, and famous western music shows. The ranch offers facilities for training of young scouts, beautiful scenery featuring waterfalls, rolling forested hills, and streams, great live entertainment on the stage, and authentic Wild West grub. Check their calendar to see who is coming to sing next. The Commemorative Air Force Museum is an aircraft museum located on North Greenfield Road. The museum was founded in 1978 with a donation of a World War II era B-17G aircraft named Sentimental Journey, and the first permanent hangar was built in 1985. As the number of aircraft grew, additional space was required, and a second building was constructed in 2003, giving the museum more than 30,000 square feet of exhibition and facility space. Located on East Baseline Road close to the Superstition Mountains, the Mesa Market Place Swap Meet is a large outdoor marketplace with vendors, live music in a food court, and more. Possibly the largest market place in Arizona, there are 900 merchants in 1,600 shops along a mile and a quarter of covered and handicap accessible shopping avenues. 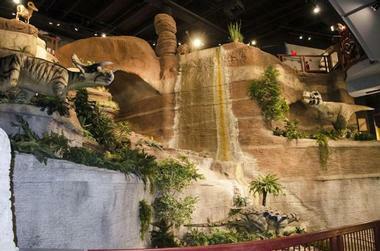 If you are wondering what to do in Mesa with kids, this is a great place to visit. Both locals and tourists enjoy shopping, walking around, and people watching while sampling the food at the food court and at the snack bars. Live entertainment is performed in the food court and the market hosts events such as a Car Show Event and much more. Browse great Places to visit in Arizona and Places to visit in Utah. Desert Belle Cruises, located on North Bush Highway in Mesa, offers narrated guided tours on Saguaro Lake. Launched in 1964, the Desert Belle is an air-conditioned ship that leads guests on a 90-minute tour around the lake, which is located within the Tonto National Forest just outside of Mesa. Capable of accommodating 143 passengers, the two-level boat consists of outside covered seating on the second level and a partial lower level with air conditioning and a snack bar. Passengers enjoy magnificent views of the desert and high canyon walls, as well as Arizona wildlife including birds such as eagles, falcons, and hawks and mammals like bobcats, coyotes, mountain lions, and more. Superstition Farm is a functioning dairy farm that provides visitors, especially kids, with the opportunity to learn about dairy farming and colorful but hard rural life. 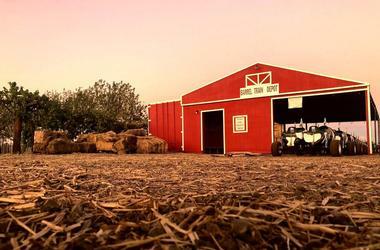 The tour starts in the barn where Farmer Casey talks about the farm, the animals, and all the chores. The hayride takes visitors around the farm to visit more than 1000 cows, bulls, babies, milk cows, and cows of all colors and ages and purposes. 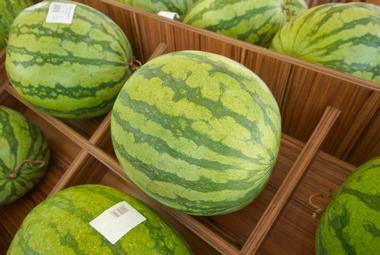 In the petting zoo, the kids will learn to feed goats, potbelly pigs, and chickens and learn about more farm animals. The tour ends by tasting many kinds of milk and milk products such as ice cream. Find great Florida honeymoon ideas. The i.d.e.a. Museum is a children’s museum that encourages kids to see the world in a different way through art, imagination, and creativity. 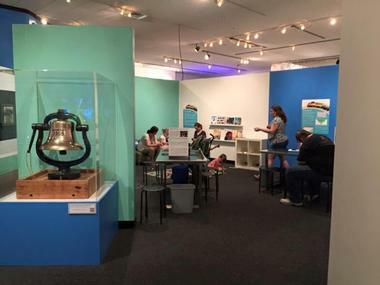 The museum had its beginnings in 1978 as the Arizona Museum for Youth, and it changed its name in 2014 to the i.d.e.a. Museum. Three main indoor exhibit areas and an outside atrium offer visitors opportunities to engage their senses and use creativity. The galleries are designed for children of different ages, and there is something for everyone. ArtVille is designed as a play space for kids under the age of five, and it invites them to play in a town that is made of crayons, paintbrushes, and glitter glue and full of colors, shapes and forms. The HUB, a gallery with 11 interactive spaces, allows children to create artwork using recycled materials, create music, and dance to forest sounds. Kids learn about science, problem solving, or inventions through different games and play spaces. The museum is a wonderful space to spend a rainy afternoon. Kids will learn a lot just by playing and having fun. 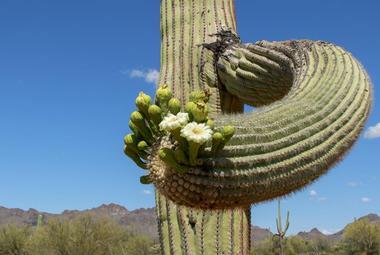 More great destinations: Best Things to Do in Phoenix, Arizona. Many of us start the day with a coffee on the run or a bowl of cold cereal, but T.C. Eggington’s proposes a few superior options: freshly baked cinnamon buns fried in custard batter, pastries stuffed with crabs, or apple walnut muffins. If you make it a brunch, you can even have a mimosa with your meal. This warm eatery filled with a delightful aroma has been treating Mesa residents with a proper breakfast or brunch for the last 30 years. On the weekends, the pleasant country-kitchen atmosphere draws in many of families that indulge in their omelets, pastries, and eggs in every shape and form. 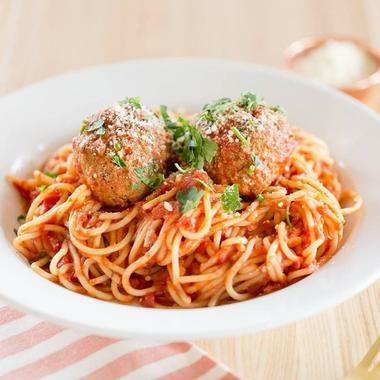 A sleek, modern eatery located in The Shoppes at Parkwood Ranch, Babbo is a popular Mesa Italian restaurant where families gather over delicious meals of Italian classics and American comfort food. Don’t let the unassuming décor and unpretentious menu fool you, the food is superbly prepared with unique flair using the freshest local, seasonal ingredients. Classics such as bruschetta come with toppings like roasted red bell pepper and goat cheese or fig & prosciutto topped with arugula. Besides traditional homemade pastas, they also serve zucchini noodles with spicy marinara, tomato, anchovy paste, onion and fresh basil. Babbo’s has a full bar as well as Italian sodas. There is nothing like Organ Stop Pizza anywhere else; it’s a pizza parlor where the pizza oven is not the star of the show. 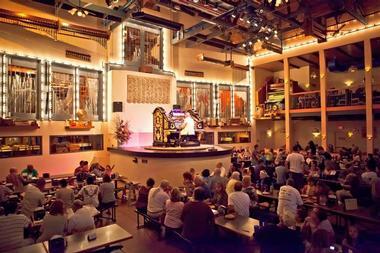 In fact, the entire restaurant is built to accommodate the biggest Wurlitzer organ in the world. And yes, they do have pizzas too. This interesting restaurant concept has been a feature of Mesa for the last ten years, and Organ Stop Pizza has been the venue for many concerts, fundraisers, and community events. People come for the pizza and wonderful music – the organ was built in 1927 for a Denver theatre and has been significantly enlarged and refurbished since then. There are three regular reputable organists playing for the guests every day starting at 3 or 4 pm depending on the season. They serve delicious pizzas, and the clients choose which ingredients they want – nothing is set in stone. 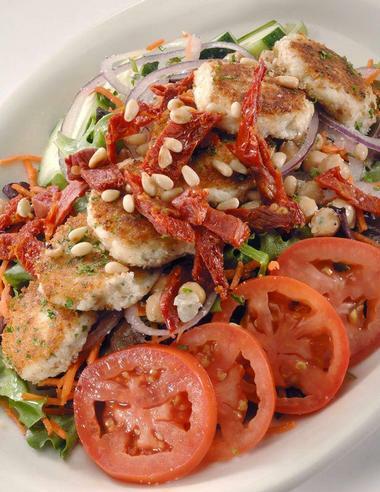 There is also a gluten-free pizza, along with salads, pastas, sodas, beer and wine. Located on North Bush Highway in Mesa, the Saguaro Lake Ranch Stables offers horseback riding and trail rides in the Sonoran Desert and Goldfield Mountain Range. There are several choices for rides, from half an hour up to two hour rides, all led by experienced guides. The guides take riders along ridges with saguaro cactus plants and along the Salt River and across dry arroyos to the top of hills that offer breathtaking views of the area, including Saguaro Lake. These rides are popular because they give guests the feeling of riding horseback like cowboys during the days of the Wild West. The ranch operates from October 1 through May 1. 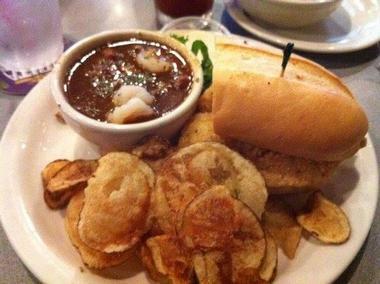 Baby Kay’s has been the go-to place in Mesa for a bowl of gumbo or a plate of jambalaya since 1989. The restaurant instantly transports you to quintessential New Orleans with dark red walls, vintage furniture, recycled barn wood wainscoting, and refurbished windows with wood latches. The menu is the original Baby Kay Romero menu, which dates back to the times Kay Romero was running this unique Cajun kitchen in Colorado. The crawfish, which do not live in the area, are shipped every few days from New Orleans, but everything else is sourced locally from suppliers such as Barb's Bakery and Schreiner's Sausage. They make their salad dressings fresh every day. The best option if you want an introduction to Cajun and Creole cuisine is a combo of gumbo, crawfish, and jambalaya. Soft background live music featuring popular jazz, blues, and bluegrass tunes completes the New Orleans vibe. 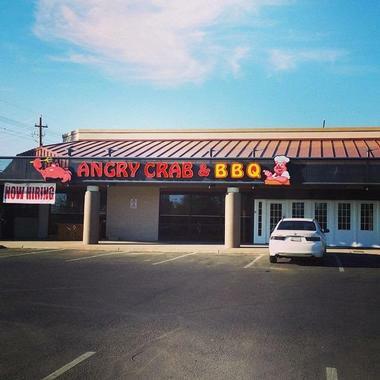 Angry Crab Shack is the kind of place where the tablecloth is made of wax paper and they strap a bib on you as you enter. The walls feature flat screen TVs and about million signatures – everyone leaves one. Don’t expect any cutlery, because that is what you have fingers for! If you are not familiar with Cajun food, definitively try some frog legs and alligator nuggets, just so you can say you tried them. They also serve some nice local craft beers in addition to their regular beers on tap and sodas. More Vacation ideas: Best Restaurants in Memphis and Best Things to Do in Anchorage. The Arizona Cactus League, located on North Center Street, is a baseball association. Since 1947, spring training for baseball teams has been a popular tradition for fans in Arizona, and there are 15 teams that train in the greater Phoenix area. This is more than any other location in the U.S. Located in Mesa, Sloan Park serves as the spring training grounds for the Chicago Cubs, and Hohokam Stadium serves as the spring training grounds for the Oakland Athletics. The Cactus League is an important part of Arizona’s economy because of its immense popularity with baseball fans, who come from all over the country as well as from other countries. There are sandwiches and then there are Flancer’s sandwiches. You would never guess it from the casual, understated décor, but they do not call their food “gourmet grub” for nothing. They start with their own bread, of which they have several kinds, including multigrain and gluten-free. Then, they stuff it with interesting mixes such as chicken with marinated prickly pear. 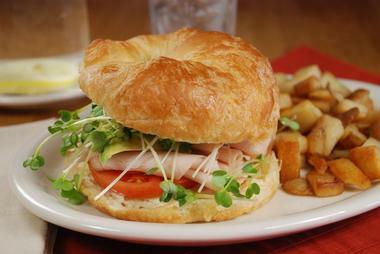 Their Club Sandwich has turkey, ham, bacon, provolone cheese, lettuce, tomatoes, green chili, mayo, and avocado. Besides sandwiches, you can also get burgers, salads and pizzas, which include more interesting gourmet options such as roasted wild mushrooms, caramelized onions, home-made sausages, fresh basil, and balsamic glaze. Thai food is an acquired taste, but once you acquire it, you will start to crave it everywhere you go. 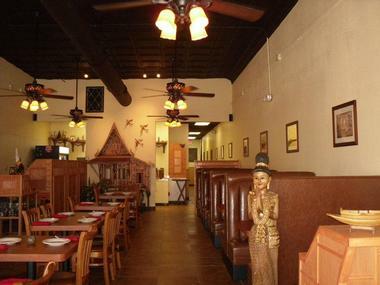 Nunthaporn’s Thai Cuisine is one of those modest looking places that has the ability to surprise you with authentic flavors and a nice choice of dishes, some traditional and some new and innovative. The restaurant is located on the Main Street in historic downtown Mesa, and you can enjoy people watching on the promenade while munching on some spring rolls or chicken satay sticks. The restaurant specializes in green curries, but the menu is extensive and there is something for everyone. If you are looking for unique date ideas in Mesa, this is a great place to try. All dishes are made from fresh, seasonal ingredients and cooked Thai style- crisp, bursting with unforgettable flavors. Be careful when ordering; some dishes are too spicy for the uninitiated. Augusta Ranch Golf Club is an 18-hole golf course famous for its excellent playing conditions and very challenging layout. While it is very popular among people new to the game, players of any ability level can go out and enjoy playing golf while using every single club in the bag and enjoying every minute of it. 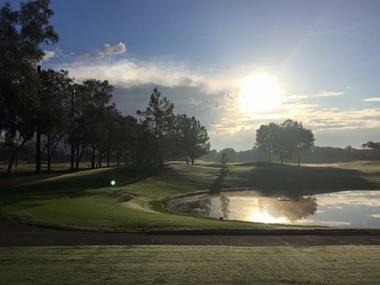 The course is great for busy professionals who do not have much time to indulge in their favorite sport because at Augusta Ranch, golfers can play all 18 holes in about three hours. The club has PGA instructors for visitors’ first lessons or for tune-up lessons for more experienced players who wish to improve their game. The club hosts frequent clinics, tournaments, and leagues, including the popular Night Golf, which stipulates the use of glowballs. 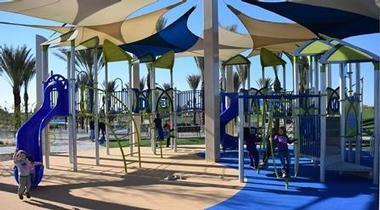 The recently renovated Riverview Park is located on West Eighth Street at the northwest corner of Rio Salado Parkway and Dobson. The park is a popular recreation destination with an amazing playground that includes features such as a 60-foot long rope climbing area, a 50-foot high climbing tower, two separate play areas for younger and older children, shaded picnic tables, a fountain, and much more. There is also a splash pad area with many water features as well as the Community Fishing Lake, which the Arizona Game and Fish Department stocks with fish throughout the year. Within Riverview Park is Sloan Park, the Spring Training Facility for the Chicago Cubs.